Gorgeous Model Trish Goff in two different looks at LFW. Love that she is working the same bag and gold cuff in both looks. Being Australia Day (waves to any Aussie readers out there! ), I couldn't resist including two Aussies that I photographed in Paris outside the Collette Dinnigan show in Paris last season. This girl, whose name I have completely forgotten (which I feel super bad about as I wanted to tell you about her label) lives in NYC and has a fashion label with her partner. They gave me a lookbook and I seem to have permanently misplaced it (think it was when I was clearing out my handbag in preparation for my visit to the US) :( But, anyway, she was wearing pieces from her label! p.s. having a hot Milo and a couple of Tim Tams tonight after supper as my Australia Day Treat! Hmmm okay, so maybe more than just a couple of Tim Tams- crikey they are hard to stop at just one! Michelle, from Australian NW magazine, outside the Collette Dinnigan show in Paris. NW magazine used to be one of my weekly must-reads when I was living back home in Australia: great for catching up on all the celeb gossip during the train/bus ride home. The perennially elegant (and beautiful) Caroline Issa, publisher and editor of TANK magazine. Love the sportswear influence (the hoodie) teamed with the Louboutin's. p.s. I am aghast at the fact that I am still posting photos from last year's fashion weeks when the next one is just about upon us. I have no one else to blame but myself....too much faffing about and not enough blog posting! Anyway, I still think it useful to post the photos as it gives us a little peek at what me might be wearing/influences for the coming spring/summer. Plus I think, given the current weather in London, that everyone will be rugged up for the shows in February so I will be posting lots of winter looks then! Christine Centenera, fashion editor, Harpers Bazaar Australia, and owner of the most gorgeous pair of legs! Laily, who is Brazilian (she is from Sao Paulo) but who currently lives in Dublin but who I met in Soho in New York! Laily's sunglasses are Balenciaga and her badge, Sonia Rykiel. I took this guy's photo after passing him while he was lining up at a street vendor/lunch truck in Soho to buy his lunch. 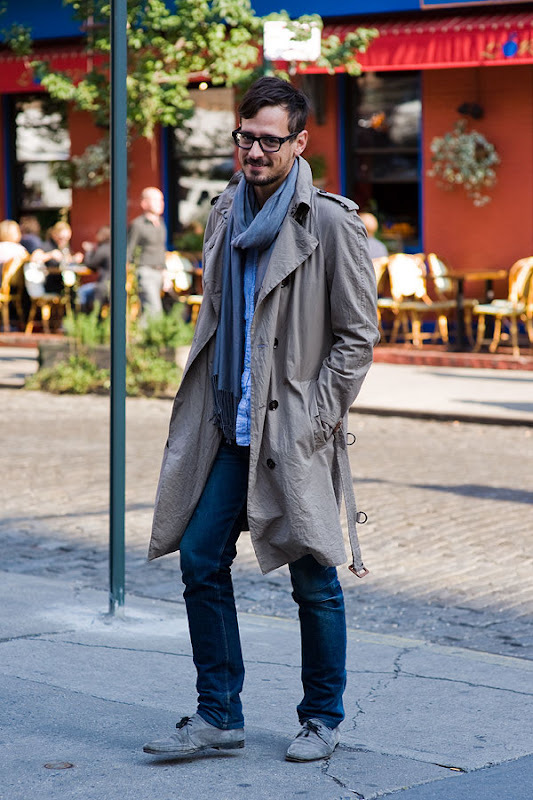 I rather liked his casual, slung-together look and especially his suede shoes. And because his lunch looked very tasty, I went back to the street vendor about an hour later and got one of the beef/beans/rice wraps for myself (flinging aside all thoughts of food poisoning, of course!). And it was nice although I think they had just cleaned the grill so there was an ever so slight whiff of detergent which accompanied most bites!